Lanyrd was an event silo focused on conferences that appears to be read-only as of 2018-01 (and was down at times during the month). The Lanyrd site has been down/unavailable for several months at the end of 2017/early 2018. It came back up on 2017-01-27, but there is no simple data export other than saving raw HTML pages, screen scraping, and/or back up to the Internet Archive. A new competing website run by Perch founders Rachel Andrew and Drew McLellan called notist has a blogpost about a tool they've built for transferring some of your old Lanyrd data into notist as well as sending you a copy of it as well. Pretty sure most of this is already covered by a combination of h-feed h-entry h-event h-card however I think to know for sure we need to actually fully mark-up all the information in a way it can be consumed and then see what's left over and still needs to be marked up with extra properties, tags, objects etc. 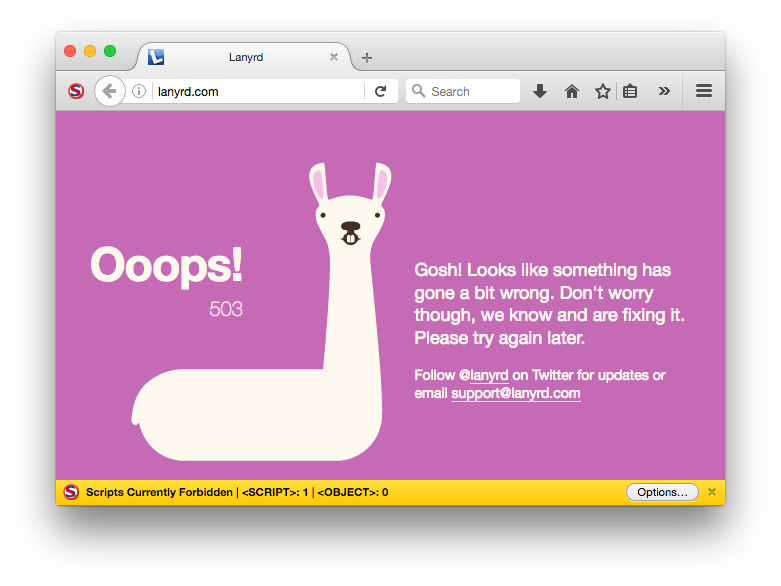 Numerous people have reported Lanyrd to be down during January 2018. It has been down for over a week. It has now been added to site-deaths. The site came back in read-only mode on the morning of 2018-01-27, with no indication of how long it would remain online. There is no explicit available data export mechanism though users can save pages as HTML or back them up to the Internet Archive or via other manual means. Lanyrd disappearing all weekend has prompted me to work on adding speaking stuff to my own site. Amazing how much data I didn’t ‘own’. Gosh! Looks like something has gone a bit wrong. Don't worry though, we know and are fixing it. Please try again later. Follow @lanyrd on Twitter for updates or email support@lanyrd.com"
This page was last edited on 20 February 2019, at 12:31.